I still remember back to the first few months I practiced yoga, in the fall of 1994. I started attending once a week, on Tuesday nights. By the end of October it was twice weekly, and by November, almost daily — whenever I could. As the poses became more familiar I began to notice their effects beyond the physical. My brain felt sharper and clearer, able to focus well into the afternoon. I was learning to ditch my distractions, to train my mind away from rumination and endless thinking by focusing on challenging postures, and a drshti (focal point) for each pose. One way to ditch your distractions is to focus, just as relentlessly, on something else — like your breath, the space between your eyebrows, or a mantra. Through the repetition of regular practice, the mind becomes more habituated to this focus instead of wandering, from worry to daydream and everywhere in between. 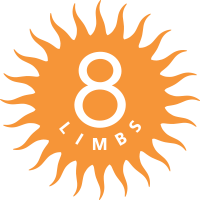 To support the habit of daily practice, in February 8 Limbs will again host our annual 28 Day Commitment, featuring wrist bands, in-studio tracking graphs (stickers! ), and a free bring-a-friend pass. Want to join us? All you have to do is commit to practice, every day in February, be it at the studio, at home, outside, or on the road. This year’s theme, Roots of Yoga, comes from a commitment to link our modern day practices of yoga to their source teachings and teachers — both to show respect and to inspire a deeper understanding of this powerful lineage. Over the past year, what distracted you? What pulled your attention from what you really want/need to do, if anything? And this year, what will you focus on? What will help you to be steadfast and present, able to do what needs to be done and meet each moment for what it is? Ditch your distractions! And have a Happy New Year!